Hallowe'en*, one of our pink star Harrison Butlers, has been found. The spooky green hull colour of the top photograph was immediately recognized by Paul Leinthall-Cowman. I'd previously pulled the photo off the internet and dumped it in a file of 'unknown' boats, created whilst researching all things Harrison Butler for this website. Back on the intranet she remained a ghostly presence that proved hard to pin down. It transpires she was FOR SALE in the Netherlands three or four years ago, then either SOLD or withdrawn from sale. Part of aurora was spirited away once I realised that the distinctive green hull was painted white in order to make her easier to sell. The second photograph shows what she looks like now. Paul is awarded the * . 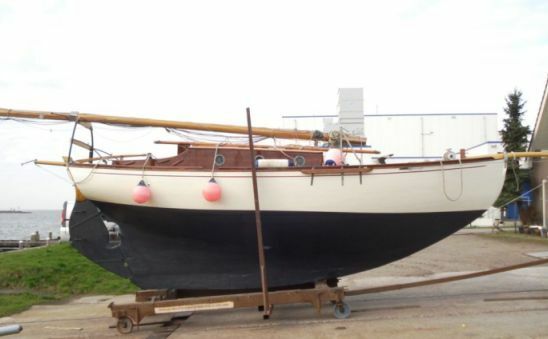 I'd love to hear from the new owner and be told that her official number is 163697, that she was registered in Southampton, and has sail number 87. That would absolutely confirm that this boat is Hallowe'en*. In June 2016 I received an album of photographs, taken between 2001, when Ewoud Bon 'found' Hallowe'en in Northern Ireland, and 2009. 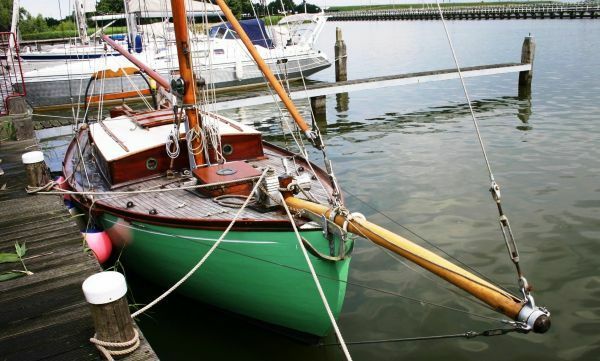 A Dutchman, Ewoud bought her and took her to the Netherlands - The album includes a photograph of her in the Stoboughtfberg yard in Enkhuizen, about 40 km North of Amsterdam. The album goes up to 2009 - I'm uncertain if Hallowe'en then changed hands or not. 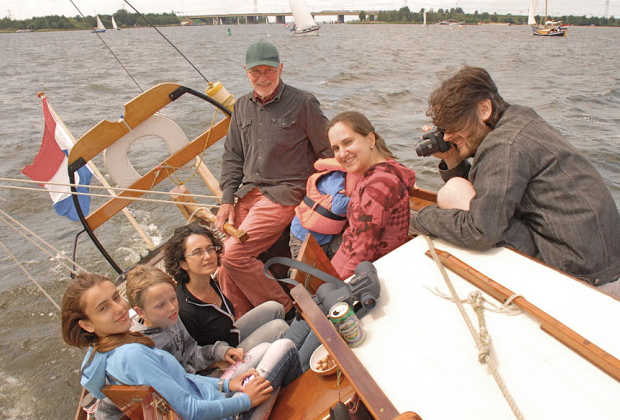 From the album I've selected a shot of Ewoud with family and friends aboard Hallowe'en. Two late visitors from Paglesham, the aux cutters Delphinus and the Hallowe'en (Dr FT Evans) called at Waldringfield and Ramsholt during the week of fine weather experienced in early October.